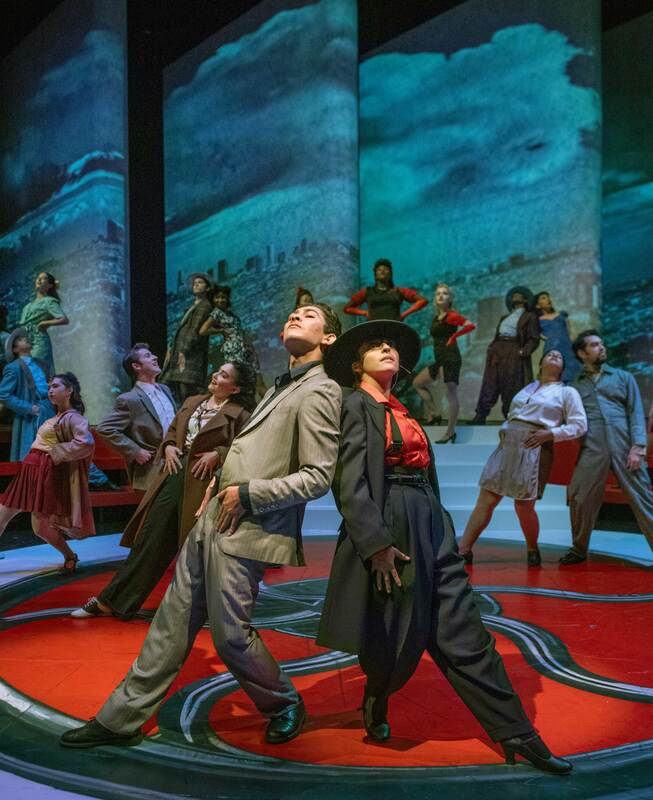 The Theater Arts Major combines drama, dance, critical studies, and theater design/technology offering students an intensive, unified undergraduate program. Combining theory and practice, the program seeks to educate the mind, the body, and the imagination of students. Graduates of the UCSC program typically pursue careers in professional theater and dance companies, in film and television, and in teaching at all levels, from university to high school to grade school. Others engage in careers in arts administration, dramatic writing, and related fields. The program stresses the interrrelation of dance, drama, and theatrical design and technology as essential to the successful practice of the theater arts in the contemporary world. The lower-division curriculum requires a range of practical work in the various subdisciplines and a rigorous exposure to the history of drama and dance. At the upper-division level, students are given the opportunity to focus on an area of interest within the discipline in limited-enrollment studios and through direct interaction with faculty. At the same time, they are asked to expand their theoretical perspectives through confrontation with the range of dramatic theories and focused course work in the history and theory of dance, drama, and design. The impact of digital and new media on theater is also explored. The robust stage and studio spaces available to students of theater arts allow for this breadth of training and performance opportunities. Based on respect for the classical theater of all cultures, combined with a determination to challenge tradition and fashion, we educate our students in the history, theory, and practice of theater, providing them the tools to shape the future of performance. The UCSC Theater Arts Department is committed to an educational mission, an artistic environment, and the creation of art that communicates to and welcomes all people, regardless of gender, race, cultural affiliation, sexual orientation, gender or sexual queerness, or economic class. We are a diverse group of scholar/artists united by a passionate belief in the value of the performing arts. The diversity of our faculty and students’ background is reflected in the offerings of our curriculum, and in the traditions we draw from for the art we produce. Based on respect for the classical theater of all cultures, combined with a determination to challenge tradition and fashion with equal courage, we educate our students in the history, theory, and practice of theater to address fundamental issues with the tools of body, voice, mind and imagination, and to shape the future of performance.We seek to create a training ground for theater scholars and practitioners who want to experiment with theories and modes of performance that push the boundaries of current performance scholarship and culture. Working to attain the highest levels of intellectual and artistic integrity, we serve the research mission of the university, our audiences, and the students who will shape the theater of the future. In our educational program and productions we strive to represent the diversity of the cultural traditions we draw from, as well as that of our body of theater practitioners, students and faculty, and audiences. Our undergraduate curriculum educates on and explores theatrical history and traditions from five continents, from Indonesian puppetry to African dance, Shakespeare, Chicano teatro, and modern experimental theater. Our productions have ranged similarly, exploring numerous dance traditions, traditional Indonesian theater, non-traditional Butoh theater, and more. The Theater Arts Department annually supports the work of the African American Theater Arts Troupe, or AATAT, which is also affiliated with the campus-based Rainbow Theater company, which also upholds a commitment to diversity. The theater arts exist at not only a crossroads of modes and traditions of theatrical performance, but also at one of traditional and evolving cultures. Theater is a dynamic art form that adapts to the world and peoples around it more readily than any other. We strive in our department to put our students and our art at the forefront of the evolving cultures and identities of our society. A wealth of production opportunities is offered to students. This includes major productions directed by faculty or distinguished visiting artists each quarter, productions directed or choreographed by students, and faculty-directed workshops. Undergraduate students are also given the opportunity to see their own writing, choreography, or intermediate concepts put into production in annual festivals of student work. Although majors are given preference in studio courses, most courses and productions welcome nonmajors as well. Opportunities to study and perform non-Western as well as Euro-American traditions are also a significant part of the program. Majors who wish to intensify their study of one particular theater arts area before seeking admission to MFA or PhD graduate programs, or work with professional companies are encouraged to apply to the department's Master's of Arts Program. A unique resource for UCSC students is Shakespeare-to-Go, a 45-minute Shakespeare outreach production in which students perform and tour (during spring quarter) for audiences throughout Santa Cruz county and beyond. For a listing of some of the production opportunities available by specialty (design, acting, etc.) please see this page here. Our program incorporates dance, design, and drama as essential disciplines in the successful practice of theater arts in the contemporary world. 1. Foundations of Performance. Students should be able to identify and apply basic theatrical techniques in dance, design, and drama. 2. Theatrical histories and theories. Students should be able to recognize and analyze performance works within the general culture and historical period that produced them. 3. Performance experience. Students should be able to translate theater arts concepts into performance, participating in any theatrical endeavor with the rigor, discipline, and imagination necessary to make a meaningful contribution. 4. Research proficiency. Students should be able to formulate personal research questions that expand their knowledge of theater arts, conducting independent research into the history and theory of at least one area of concentration. 5. Creative practice. Students should be able to use theatrical practices and performance experiences to conceive, design, realize, and reflect on new performance projects. 6. Appreciation of diversity. Students should be able to recognize and appreciate a wide variety of approaches, cultures, and styles in both past and contemporary performance practice. 7. Communication and critical thinking. Students should be able to use critical vocabularies to communicate clearly about theater arts in written and oral forms. 8. Collaborative skills. Students should be able to work confidently and effectively in groups on a common project.